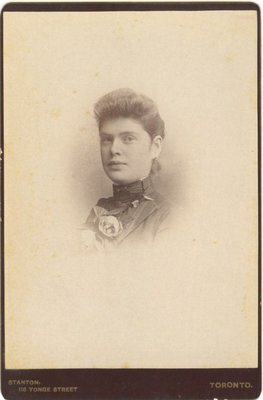 A photograph of a young woman from the photo album belonging to Margaret McCague Wright and her husband William Ashford Wright. This is presumably the picture of Elizabeth Wright. The note on the back side of the photograph says: To Maggie from Lizzie. Photographer Eldridge Stanton is listed as operating in 1888-1892 in Toronto, on 116 Yonge Street.